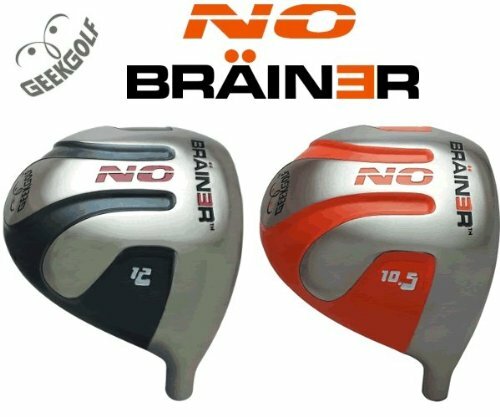 Inspired by Muscle Cars, Geek Golf Introduces a true Muscle Head...The No Brainer!!! Due to the distinct placement of extra weight incorporating the design characteristics of the sole and body of the NO BRAINER...this is truly a 'Muscle' head...hence the tie-in to Muscle cars! The Aerodynamics of the body works to enhance the unique weighting design of the sole of the club. The sole weighting runs from 'heel to toe' directly behind the face which then extends in 3 weighting configurations going from the front portion of the club sloping to tapered positions to really increase the MOI and drop the COG further back and upward without utilizing a 'skirt' on the sides and back portion of the club which in turn applies more weight where it will do the most good. Steve Almo, of AlmoDesigns was recently quoted..."anyone can add weight to a head...you MUST incorporate the added weight into the design characteristics for optimal performance. Where you put the added weight to increase performance is key. If you have any questions about this product by Geek Golf, contact us by completing and submitting the form below. If you are looking for a specif part number, please include it with your message.